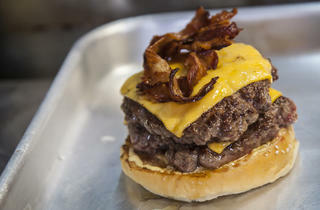 Highest-quality burgers from a street food stall. 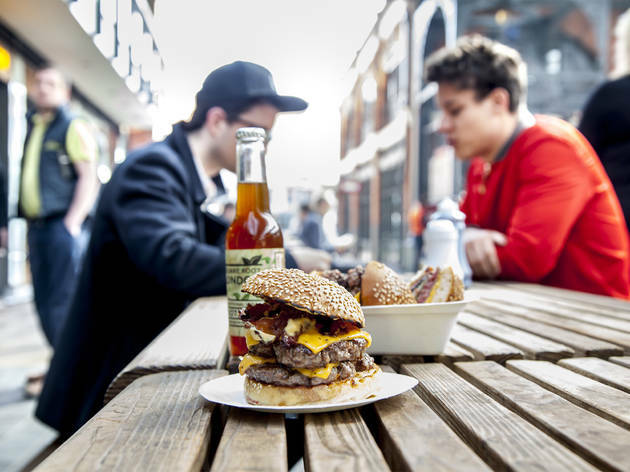 Bleecker Street take the hunger out of Hungerford Bridge when positioning their food truck down there, and have whipped up a street food storm at Spitalfields Market since parking up permanently. That’s all down to a stripped-back but hugely satisfying formula for the all-American burger. Show-stopping dry-aged beef cooked pink is complemented by Bleecker’s ‘secret sauce’ that tastes every bit as peppery as McDonalds’ Big Mac mayo (but more upmarket, obvs). Cheese is as orange as the Waterloo sunset and seeded buns are toasted to perfection, perfectly mopping up those excess patty juices without ever compromising your vice-like burger grip. 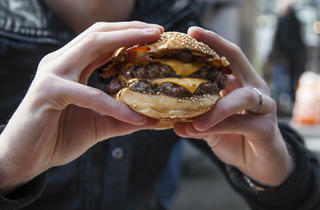 The standard bacon cheeseburger (£7) will be plenty for most people. If you’re in the mood for yabba-dabba-doo, however, go for the double (£9). There are just a few tables and you’ll be eating in the food-stall periphery of the bustling market, so don’t expect much in the way of comfort or ambience. But is that what you're here for? Of course it isn't. One of the best burgers in town! Over-juicy but juicy burgers are the one that I personally love. For some might seem too oily though - not full star rating due to extremelly high price for such small size burgers and chips. I've been waiting to try this for the longest time, and it did not disappoint. The whole burger had a melt in the mouth feeling, with an authentic true American taste. The bun was soft, with just the right amount of cheese. The no frills stall added to the authenticity of the experience, as you could literally see your burger being flipped and made on the spot, with benches right outside to sit at to enjoy your burger. It was really filling, so I didn't try the fries - but will be going back for more very soon! Yes yes yes! Proper juicy burger with lots of flavour! Love thin American style burgers with lots of cheese. Wholly recommend you wash down with an ice cold American ale! Thanks Bleecker- will be back! 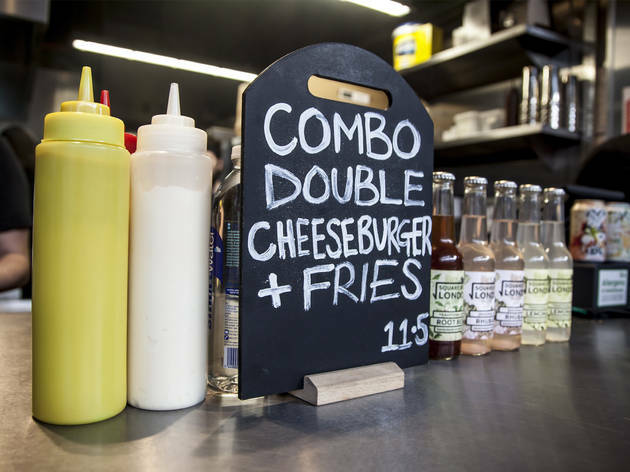 If you're a burger fan then you've probably already sampled Bleeker Street burgers. Great tasting medium rare burgers, with nom nom fries. Cooked fresh in front of you, so if you're heading to Spitalfields at lunch time there will be queue. They are a little on the small side, if you have a healthy appetite you may want to order two! Burgers start at £6, fries at £3. I hear they also do Oreo milkshakes. Finally had the opportunity to try Bleecker Street Burgers at the opening of their official restaurant in Victoria today. As you'd expect, there was a queue well before their opening at 11:30AM but the hour and a half wait was worth it! My brother and I each got a Cheeseburger and an order of their Angry Fries. As the shop itself it quite small, we did a takeaway. By the time we ate our burgers and fries, they weren't as warm but they still tasted delicious! The beef patty was juicy and succulent, and cooked medium rare, which was wonderful. It was well seasoned and the slice of cheese on top had melted perfectly, adding a nice flavour without overpowering the taste of the beef. The fries were pretty unique in my opinion - they were dressed with a blue cheese and hot sauce dressing. I liked this because the blue cheese tasted authentic and as if they had just crumbled it on top and let the natural heat from the fresh fries melt them, rather than making a sauce out of the blue cheese. The hot sauce was also simply drizzled on top so the flavours were not overpowering. Overall a lovely experience and worth lining up for! I can see why they're so popular! No fuss on the menu design and no frills on food presentation, but these burgers are some of the best you can get in London. Don't miss it. I've been searching for the best burger place and I think I've found it. Best burger I've ever tasted. I think a lot has been said here already about the bleecker black. This burger is the best I have ever had. Two prime beef patties either side of luxurious black pudding, all within a toasted bun. This burger is a must for any meat lovers. The beef is always cooked medium and remains moist and pink. As for sides, the fries are always well cooked, flavoursome and crispy. 5/5 stars for me! I had my first taste of Bleecker St Burger at Meatopia 2014 and have been hooked ever since that first juicy bite of their near-perfect beef patty. I immediately sought out their van at Old Spitalfields Market (now a permanent location) and have been a regular ever since, despite living on the opposite side of London. A simple menu, but simplicity is all you need here as the quality of the meat shines through every time. This unwavering consistency is why I can say hand-on-heart that this is my favourite burger in London, and perhaps even the world. I have honestly lost count the amount of times I have gone out of my way to seek out a Bleecker St location and not once have they disappointed or lowered the standard of their burger. With each bite the uncontrollable (and rather embarrassing) noises that come from someone in a state of pure bliss. Unfortunately their ever increasing popularity has meant longer queues (also not helped by the introduction of Deliveroo) but I promise you it will be worth the wait. Tastemaker tip: Always go for the double. Oh, and order the Angry Fries. You can thank me later. Quite simply the best bloody burger of my life. Two beef patties, black pudding, cheese and a seeded bun - the Bleecker Black was surely sent from heaven to make me happy. Get one of these in you if you haven't already!!! Pure genius - thank you Bleecker Street for this marvellous creation. I love trying out new burgers around the city and there is quite a good selection of decent places. 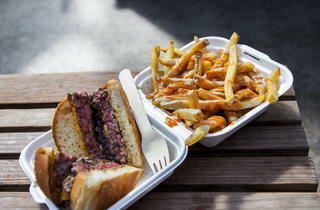 But it seems like Bleecker’s burgers have all the best qualities of good burger places around town. This isn’t just any burger. It’s religious experience. Foodgasm if you will. As much as I am trying to avoid eating much meat and attempting to switch to being a vegetarian, I doubt I will ever be able to fully commit to it, because it would deprive me of eating a Bleecker. Double cheeseburger, medium rare and chips. Buns are just perfect, not too sweet, just right. Meat melts in your mouth and as soon as you taste it you want this feeling to last forever. You say to yourself: ''I never want to finish eating this! I never want this burger to be over! '' Get the chips as well, even they are good, plus you will eat burger for longer, which is a plus. Either that or get 2 burgers. Thank you Bleecker for existing. This really is a burger of champions. Cooked medium rare, it literally falls apart in your mouth. The only issue is stopping yourself going back for seconds. 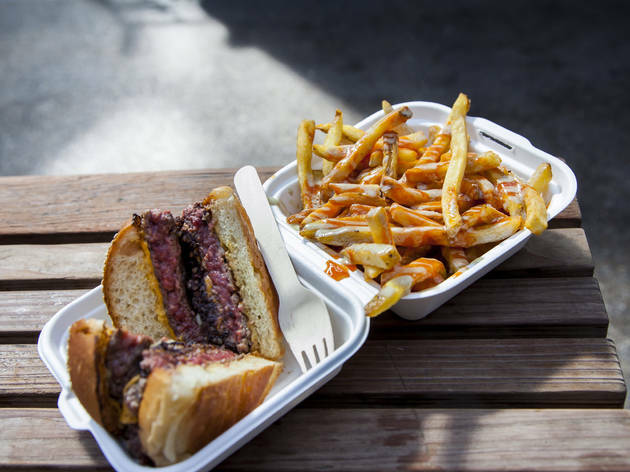 Bleecker Street is reinventing what we know about the burger van. A new branch has just opened in Canary Wharf. The double cheeseburger was phenomenal, but it's a bit pricey at £9. The meat melts in your mouth. The angry chips are delicious and names angry as they have hot sauce and blue cheese on them. A definite must try. The burger with black pudding is a must-try for locals and tourists alike — a uniquely English spin on the ubiquitous burger. This is my Mecca for burgers. Haven't had a better burger in London yet. This is made of a simply juicy, delicious patty in between toasted fresh sesame buns , topped with amazing bacon and cheese. The angry fries with blue cheese are dangerously good for your waistline. Watch out because you might get addicted! 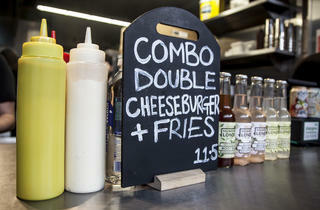 The legendary Bleecker Street burgers.... It took me a while to get round to trying them (tried many of their rivals first) and boy does it live up to its name. Brought a friend who doesn't even like burgers and she was the one who convinced us to get a second portion! The patties are juicy and flavourful and the sesame toasted bun has the perfect consistency to contrast the melt in your mouth ingredients. Accompaniments like the angry fries also give the meal an added dimension as they pack the other remaining flavours not found on the simple but well done burger into the overall experience. Definitely worth the queues, and the higher prices. 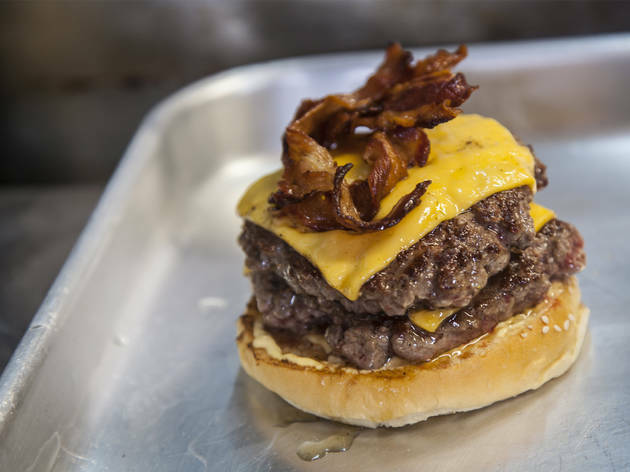 Bleecker St has been talked about so much, I was so excited to have their burger in Spitalfields market, but somehow it ended up being just your average burger. The price tag is quite big for a street food truck. 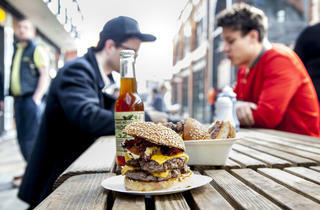 Near Spitalfields there are so many better burgers. My go-to's are Honest Burger and the Breakfast Club. If I'm going to have a burger outside, its better to take advantage of one of the markets in the area. Bleecker Street only really shines out for me when you get the burger with black pudding (if you don't believe me, check out that cut through shot), and only from the Spitalfields stand. The Southbank version is always a bit meh. There are so many places to get a good burger around town, and I had a been told about Bleecker St a lot, so expectations were high, but unfortunately not met. I haven't been to all the locations, and my review is based on visiting the South Bank, so maybe I had a bad experience considering I'm going against the tide. The burger was more dripping fat than burger, the fries decidedly average and all way too expensive. I'm not a cretin, I'm willing to pay for well made food, but much better burgers can be had from independent stalls, and many good pubs, for nearly half the price. Don't get me wrong, it wasn't terrible, and definitely not the worst burger I've ever had, but don't get drawn in by the reputation and queues before getting that all important burger fix. This is the burger that I dream about when I dream about burgers (worryingly often!). The mean was cooked to perfection, perfect balance with cheese and a bun gently toasted! These guys can be found at festivals in their vans as well so perfect to soak up some alcohol....or just past some time whilst an act you don't like is on! This burger was fantastic The meat was absolutely spot on, so juicy and delicious. It’s really well pared with the bun which was soft and just enough not to overpower the patty. I can’t stand those really tall, can barely get my teeth on burgers. Thankfully this is not one of those, curves in all the right places! With flavour to die for I could of easily had two. A wedding party even turned up for a quick bite. I can’t say for sure but I’m pretty confident that’s true love. Burgers are now a'plenty in our fair City. What was once a wasteland and reserved for drunken cheesies at kebab shops and various fast food restaurants is now being peddled on every street corner and crevasse. It is important to know the good from the bad. Bleecker street I can happily say is in the former. They have varying prices of burgers, from £6 to £10 (the mega burger), which is nice as I find paying £8 for a simple cheeseburger a bit silly. They do not skimp on their fries either, a portion of sweet potato fries easily keeping two of us happy. We are not talking Five Guys levels of fries... but it gets the job done. 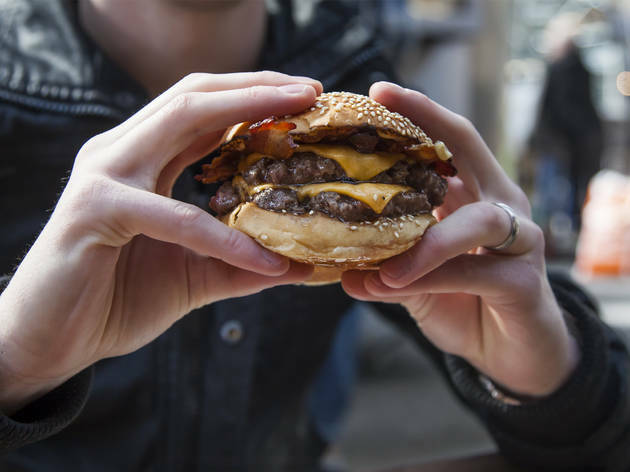 What I find important about Bleecker Street is their attention to the bun, something typically overlooked yet so important to the structural integrity of the burger. Its a hearty sesame seed bun- one who has dealt with too many brioche buns disentegrating can appreciate. Not only that, the butter the bun and then let toast on the flat-grill. AMAZING. Burgers are cooked medium rare and and the meat had a lovely taste. Pure heaven. Pro Tip: Get there as close to noon as possible as seat around there are limited.